Hi everyone! I’m Georgiana; founder of SpeakEnglishPodcast.com. My mission is to help YOU speak English fluently. In today’s episode, I’ll reveal to you the 7 secrets of the English pronunciation. Later you’ll practice your speaking with a funny mini story. The story is about a man who wants to speak English with a perfect accent. SECRET #1: LISTEN TO YOURSELF! Listening to your own pronunciation errors when you speak English can be difficult if not almost impossible to attain. What you’re usually doing is focusing on the conversation instead of the sounds you’re making. So, try to record yourself using your PC or smartphone. Do this only from time to time to observe the areas that need improvement. 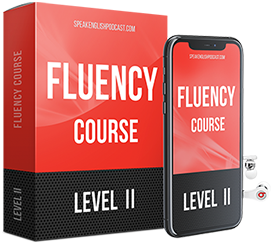 Many people hate their voice, and hearing themselves speak a foreign language for the first time will be difficult, but it’s a necessary step to develop a sense of self-awareness for improvement. I’ve noticed over the years that many English students think that speaking fluently equals speaking quickly. That’s an unfortunate misconception. When you talk too fast, you reinforce bad habits since you don’t have time to think about what you want to say next. Besides, you project little confidence. Talking slowly will help you relax and feel more confident. Hlw ma’am i hope you are doing great. A huge thank from my side. This is Sakhi from India.. This audio inspire me a lot.. My accent is developing day by day..
Hi Sakhi! Thanks for the comment. I’m happy I can help! I’m really enjoy your podcasts, however the last 2 episodes transcript is un 2 columns for page, is it possible for you put un only one column? Because is more easy for me read that in my smartphone. Hi Esteban! Thanks for your feedback! I already decided to change the podcast transcript format, and it won’t be in two columns anymore. Thank you very much Georgiana for your helpful and useful podcasts, I really love them! Thank you very much for your helpful and useful podcasts, they’re great. Hi, Nico! It’s great that you enjoy the lessons! Hi Georgiana, I can’t say thank you enough for all the work and the effort you make every time you create one podcast and all the transcripts, I follow you for a while on YouTube and lately I decided to vicite your website too. I love your teaching and your pronunciation is so clear and beautiful. I appreciate all what you do for as. God bless you. I’m sorry, I wrote all wah you do for as. I meant: all what you do for us. Lol sorry for the mistake.